After escaping the Westfjords region I continued around the Hunafloi coastline, affectionately nicknamed ‘bear bay’ after the occasional polar bear drifts in here on an iceberg from Greenland. Unfortunately for the polar bears – hungry after a lonely time out at sea – they are usually met with a shotgun upon arrival. The Icelandic don’t fancy any polar bears on their island. I’m not complaining. 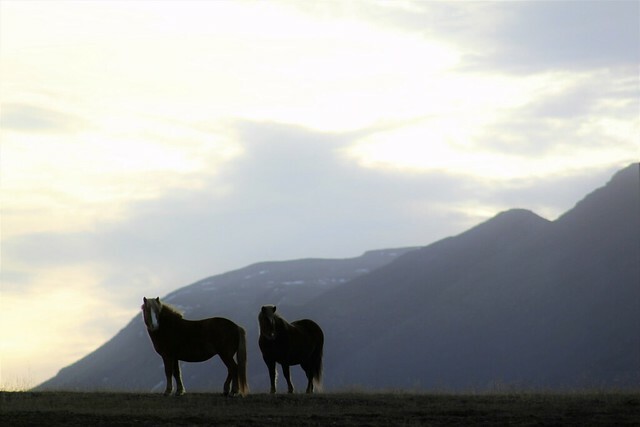 There are no dangerous animals in Iceland and that is fine by me. I was stressed the whole time I was in bear country in North America and I don’t think I’d sleep too well with polar bears around. Now I can keep food in my tent ready for a midnight snack without ending up being the snack myself. In Canada I had been excited to find that they sold Digestives in the supermarkets. Here in Iceland I was equally excited upon discovering that they have Hobnobs for sale everywhere. That first night I camped in another farmer’s field (I had to ask to do this a few times when there was nowhere to wild camp) and enjoyed a couple of biscuits with my book. There may not be any bears around but there are still plenty of annoying mice in this country. I put my empty packet of Hobnobs in my tent vestibule and a mouse came to nibble the crumbs. He was a cocky chap and kept coming back. Eventually I waited for him to crawl all the way into the pack before grabbing it closed, giving it a little shake and then lobbing it outside. The mouse didn’t come back after that! I rode up over the mountains into Saudakrokur where I had a family to stay with via Couchsurfing. It was my first night in a bed since leaving Reykjavik a fortnight long ago. It was nice to have some company and try to get my head around the Icelandic election – the results had just come in that morning. 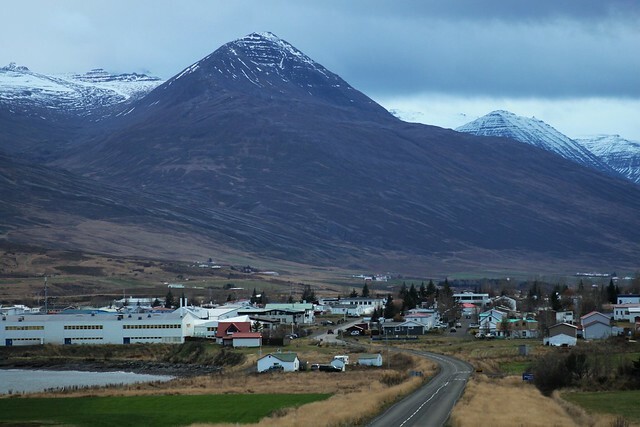 For such a small western country, Iceland has remarkably scandalous politics. 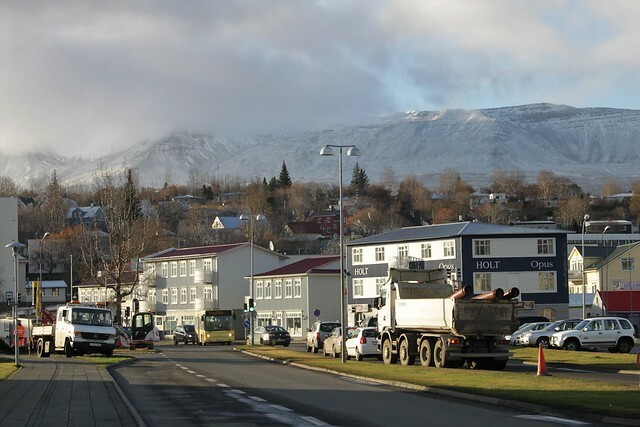 Last year the Prime Minister had to resign after the Panama Papers revealed his offshore trusts and now the latest government collapsed after the new Prime Minister’s father had tried to help the rehabilitation of a convicted peadophile (they have this weird thing in Iceland where certain criminals can have their records wiped if they get letters of recommendation vouching for them). 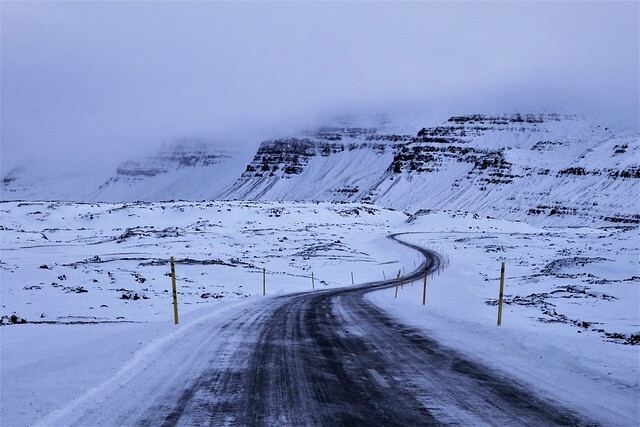 I’d had to rejoin the busy main ring road briefly around Hunafloi and it was a shock to the system after such a quiet week in the Westfjords. I decided to get off it as quick as possible so rode over to Saudakrokur and then took the detour around Trollaskagi peninsula. That was a beautiful part of the country and the weather was glorious. The skies were blue and big white mountains lined the fjords. For once the weather was being nice to me – as I reached the end of the peninsula the winds turned and so I had tailwinds the whole way around. 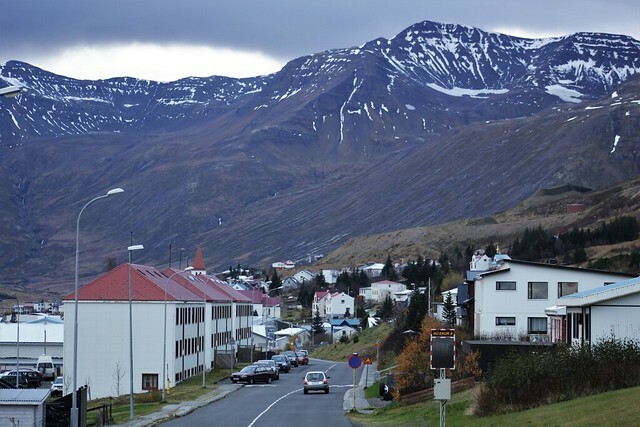 From Siglufjordur I cycled through the longest tunnel of my trip – 7km! It was only opened in 2010 and was so well lit that I felt quite safe pedalling through. 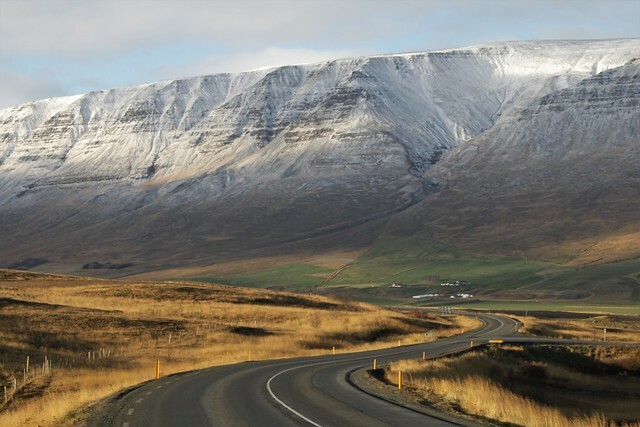 Before they opened the tunnel there was a 60 km mountain road to Olafsfjordur (at the other side of the tunnel) but when that road closed during the long winter the towns were 230 km apart! 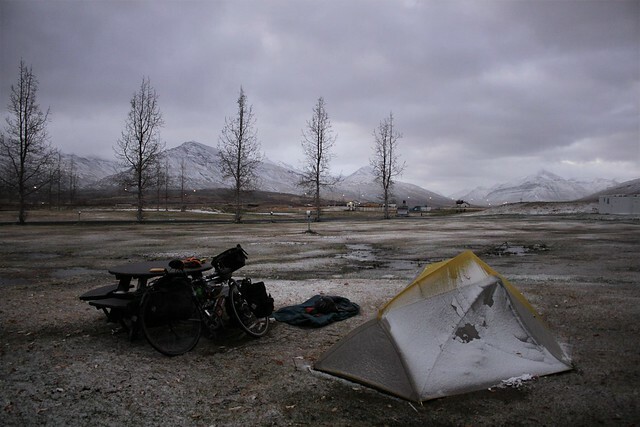 I stopped in Dalvik to ask if I could camp in the town campsite. I knew it was closed but thought I might be able to pitch there anyway. They gave me a look of “why on earth would you want to be camping at this time of year?” and said I could stay there for free. All the facilities were closed but that made no difference to me. I was in a wonderful mood. I bought a beer and a packet of crisps from the shop and sat on the bench surrounded by white mountains. 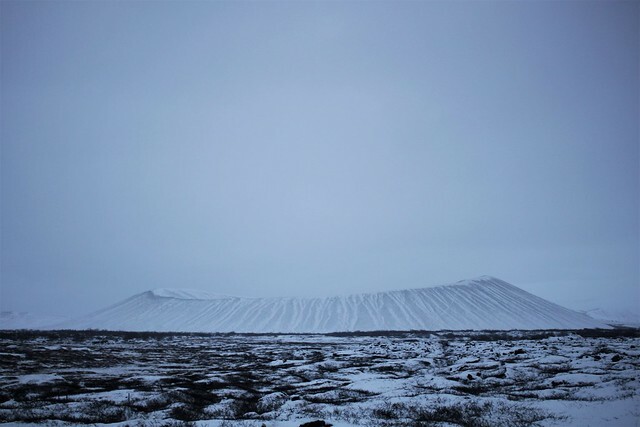 It was one of those rare moments in Iceland where the wind drops and everything is calm. I am a simple soul – beer, crisps and mountains are probably my 3 favourite things in the world. It was my first day riding on icy roads. 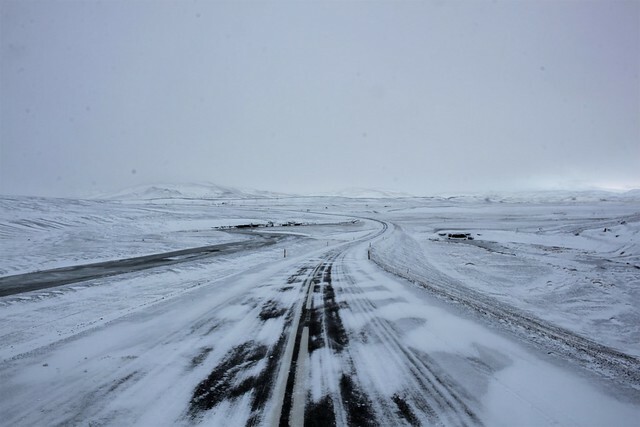 The Icelandic drivers weren’t fazed at all, they zoomed along at usual pace with their winter tyres on. That just made me even more nervous. I didn’t trust my wheels on all the ice and it was quite unpleasant having the traffic cruise at pace so close to me. Unfortunately there was another weather warning. 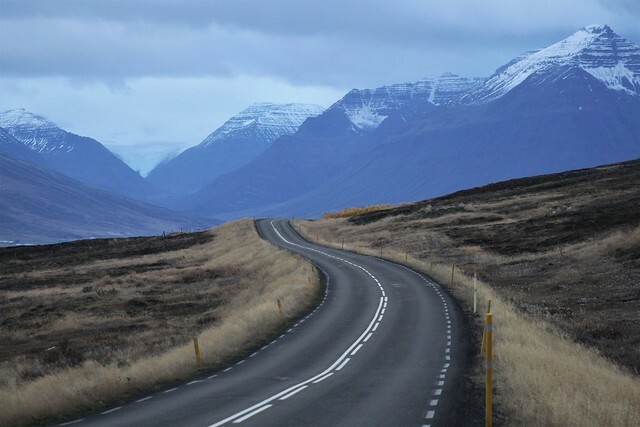 I would be rejoining the ring road from Akureyi, from where it makes a shortcut across the highlands to Egilsstadir. Lots of that section is at a few hundred metres altitude and quite remote. That didn’t concern me, it was the temperatures that had me worried. The weathermen had forecast lows of -15C over the next few days. 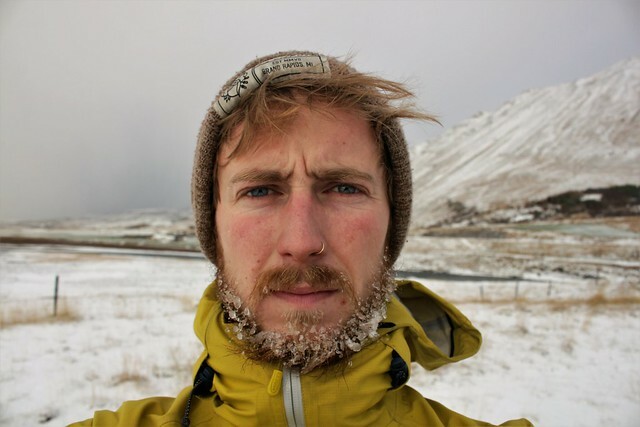 The temperatures refused to get above freezing for the entire of my final week in Iceland. 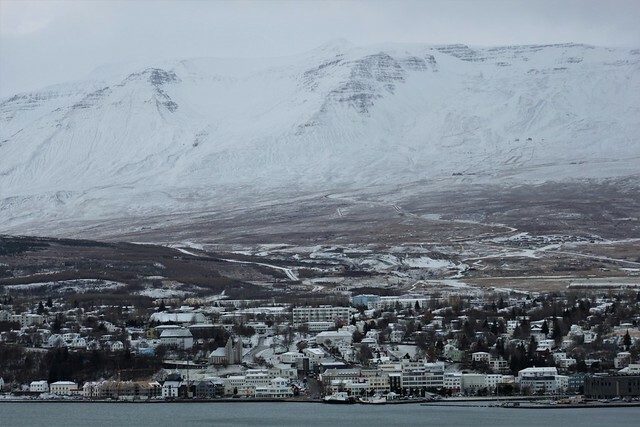 It snowed again while I was in Akureyi and the roads were incredibly icy leaving town. I slipped and fell within half a mile. That first layer of ice is always the worst. 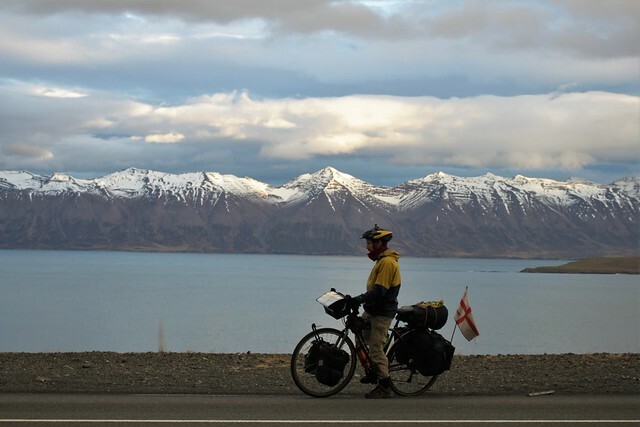 I took as much pressure out of my tyres as I thought I could get away with and continued cautiously around the fjord. 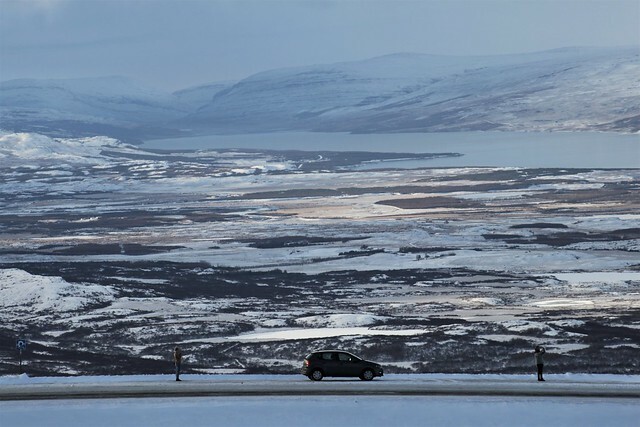 There was supposed to be a new mega-tunnel open in 2015 through the mountain heading east from Akureyi but setbacks meant that it now won’t open until 2018. For now the road heads up and over the mountain in a short but nasty pass. It was snowing quite a lot by the time I reached the start of the climb. A local guy stopped to tell me there had been an accident at the top of the mountain and that the road was particularly icy up there. I wasn’t sure how easy it would be to ride up such a steep gradient in the conditions so when he suggested a detour around the mountain I went for it. There was too much traffic on the road and I felt unsafe with so many cars around me. I rejoined the ring road a couple hours later having pedalled around the mountain. It snowed most of the day and slowly became heavier and heavier. By the late afternoon I could barely see a thing in the blizzard and was frozen to the bone. I desperately needed to get my tent up somewhere out of the wind. 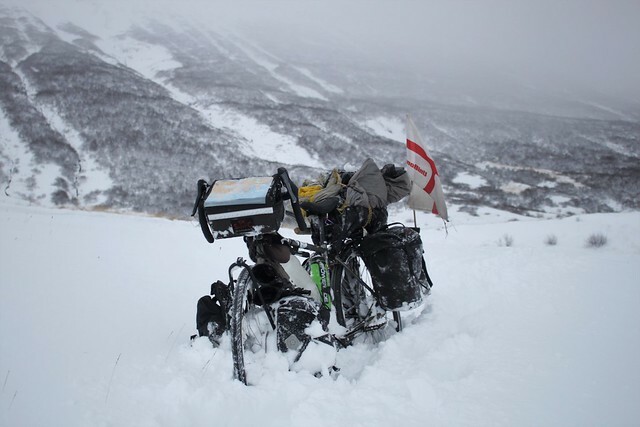 When I found a big ditch in the hills I dragged my bike over and set up camp on a patch where the snow wasn’t too deep. I didn’t sleep very well. Every time I woke up the snow level seemed to be higher and higher around my tent and the fabric was sagging further inwards. 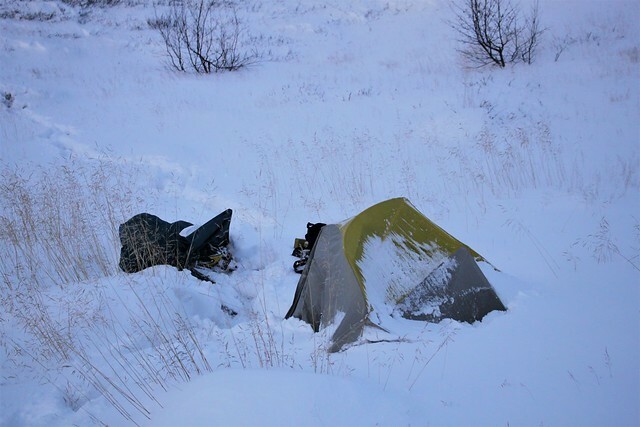 By the time morning came my tent was half buried. I have never seen so much snow in my life! Getting out the tent was a nightmare and everything got covered in snow. Now my campsite in the ditch didn’t seem quite so clever. In spots the snow was up to my thighs so wading out with all my bags back to the main road was not an easy start to the day. 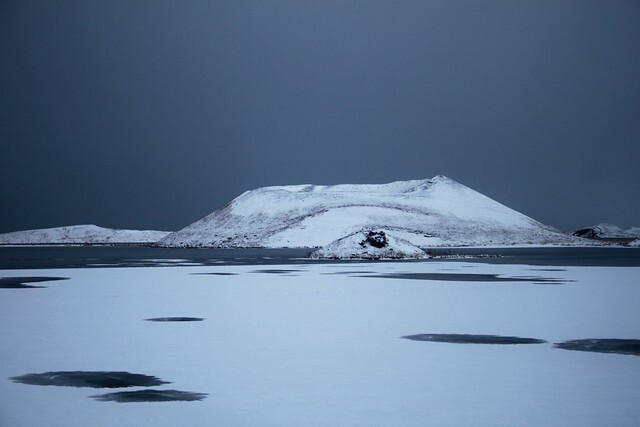 I reached Myvatn lake that afternoon and checked into the local hostel. They cost a fortune in this country – 4,5000kr (£33) but I couldn’t face a night in all that snow and wanted to dry my frozen camping gear. I hadn’t spent a penny on accommodation since my birthday in May and to be honest with you, that night in the hostel was the best 30 quid I’ve ever spent in my life. I had another good look at the weather forecast. It was not looking good. Temperatures the next couple of days were expected to be well below -10C and the storm was predicted to arrive the next night. Now it was an orange warning. The last storm I faced (in the previous blog) was just yellow. I had no idea what the colours meant but I did not like the sound of orange. They reckoned this one would bring winds up to 40m/s in this part of the country. 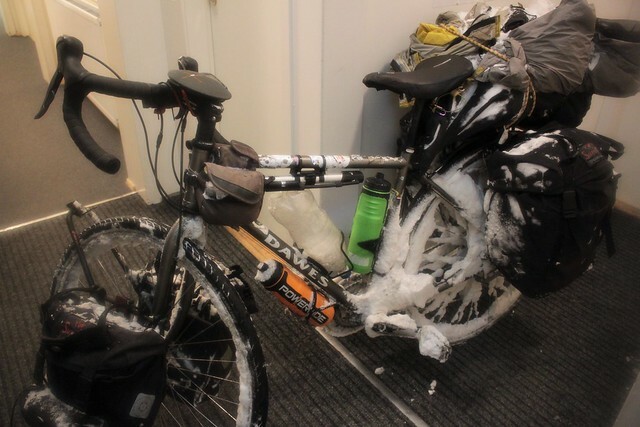 ‘Defrosting’ my bike in the hostel! I was nervous. I’d found the last two days very difficult in all the snow and cold but it was going to get far worse. 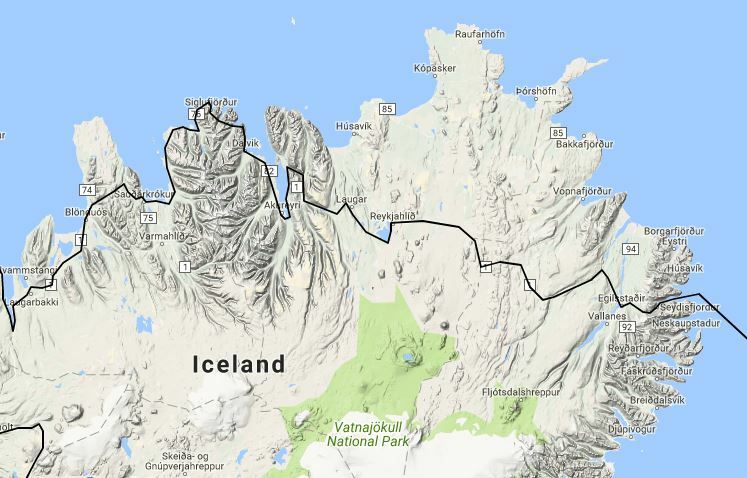 It was 165km to Egilsstadir and there was nothing on the ring road for 115km. The storm’s winds would be coming in from the South-East (the way I was cycling) and bringing a lot of snow. 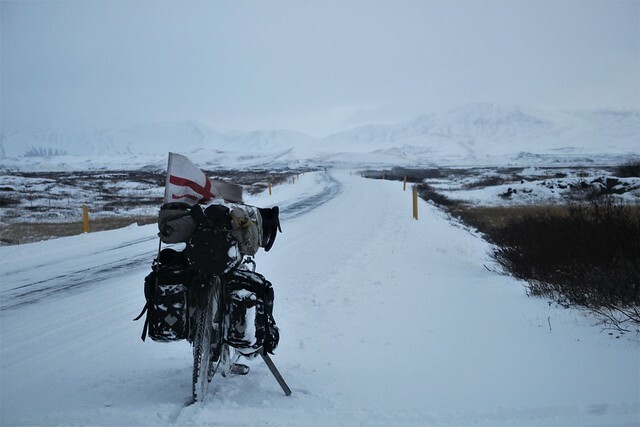 Gale force winds, blizzards, sub-zero temperatures and desolate areas are generally not a good combo! In short, I was pretty anxious. I even looked up bus times to see if I could get a bus across the highlands. I also wondered if I should just try to hitch hike across. I seriously gave a lot of thought to ‘cheating’ and skipping a section for the first time on this trip. At least, I tried to give it a serious thought but you can probably guess what I concluded. I had to go for it on my own two wheels. 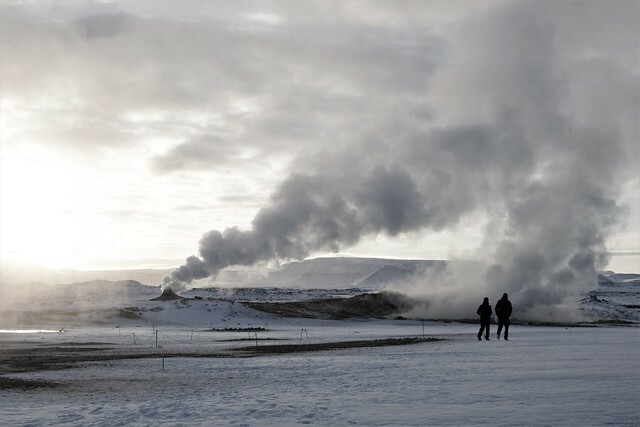 It was -12C the morning I left Reykjahlid. 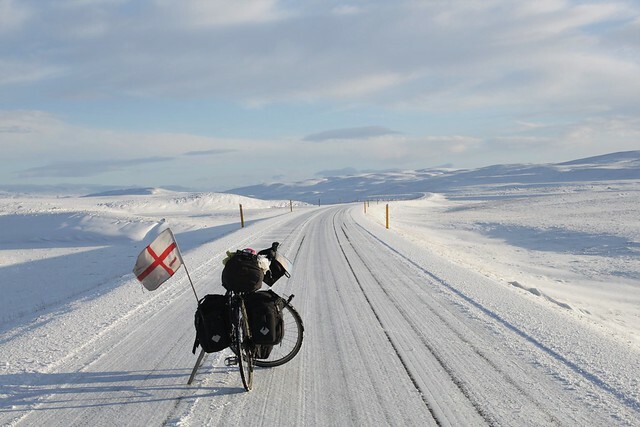 I’d now been riding frozen roads for a few days and was starting to feel more comfortable on the ice. 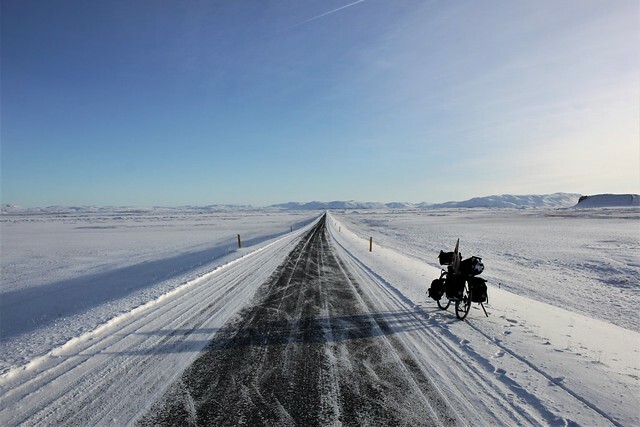 There was very little traffic on the road now so I felt quite OK on my bicycle. 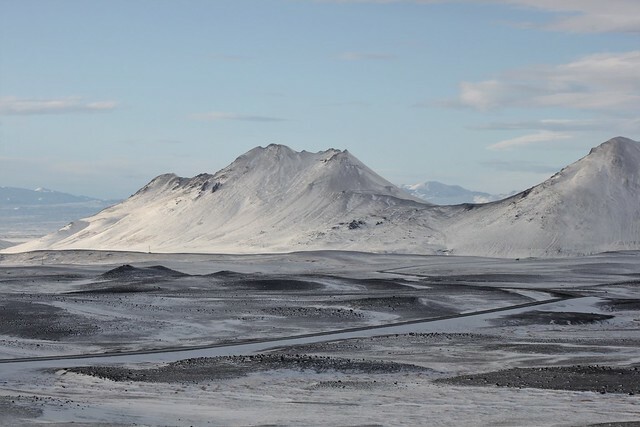 I rode up over the first mountains and into the eerie Hverir region where vents blast hot air from the snow covered craters. 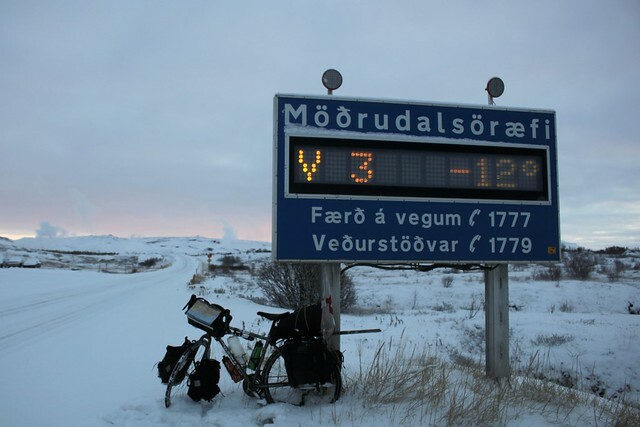 Unfortunately, -12C was not the coldest temperature that day. It was the warmest! At one point in the afternoon my thermometer was down at around -16C. 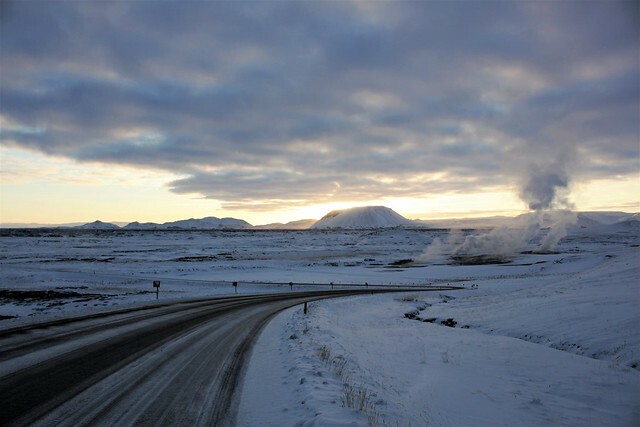 Iceland is the new winner for coldest daytime temperatures. It doesn’t beat China for night time lows – in early 2016 I had nights down at -20C but there I never had a day when the temp didn’t climb higher than -8C. I was not prepared for such temperatures in Iceland. I’d looked at the weather charts and thought it highly unlikely that I’d have days much below freezing. Clearly I was pretty far off! I’d forgotten what a pain such cold is. Everything freezes so quickly. My bottles were frozen solid within minutes and my electronic stuff wouldn’t turn on. Even my bread froze and when I licked my knife clean my tongue stuck to the metal. Water was an issue because I don’t have a thermos flask anymore and all my bottles froze solid. 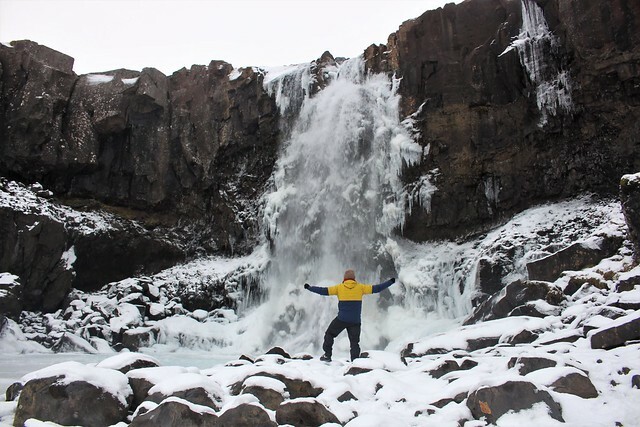 Fortunately I could just drink from the unfrozen streams or melt snow when I needed to. My fingers and toes didn’t do so well. 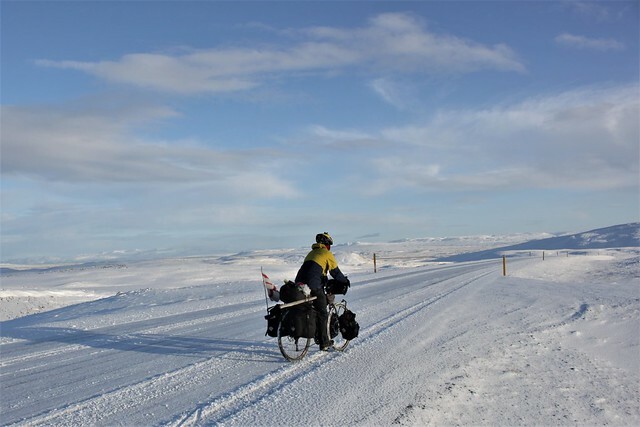 It’s ironic that I was ill-prepared considering that I even added a ‘cycling in extreme cold’ section to my website’s ‘how to cycle around the world’ guide. 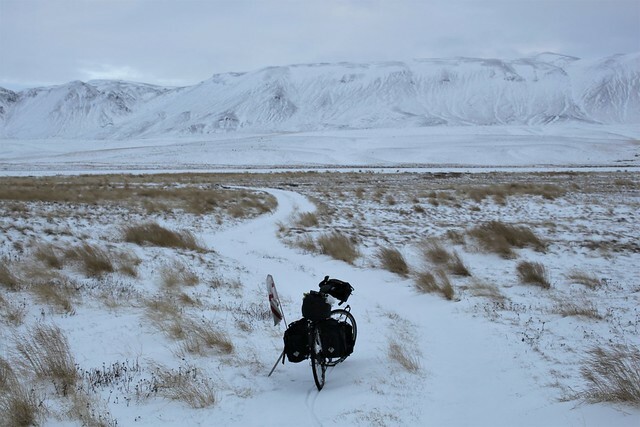 When I was up on the Tibetan Plateau not only did I have a thermos flask (for both drinking water and for melting the frozen bike parts) but also goretex mittens and steel-toe boots. Now I couldn’t stop my toes or fingers from burning in the cold. It may have been cold but the weather was glorious. Blue sky and barely any wind for most of the morning. Alone up on the highlands I was undoubtedly experiencing some of the most stunning cycling of my whole trip. In the afternoon the winds began to pick up just as the forecast had predicted. 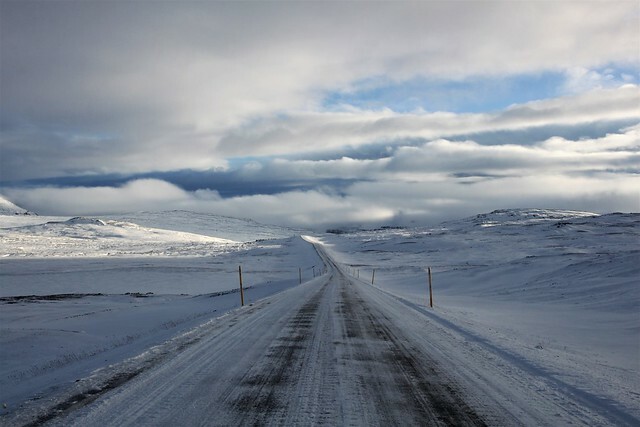 Some Icelandic drivers stopped to warn me about the storm. I told them I knew it was incoming and that I planned to find a spot to camp out of the wind. They shook their heads and gave me a stern look. “You absolutely can not camp in this storm. A big blizzard is coming tonight”. 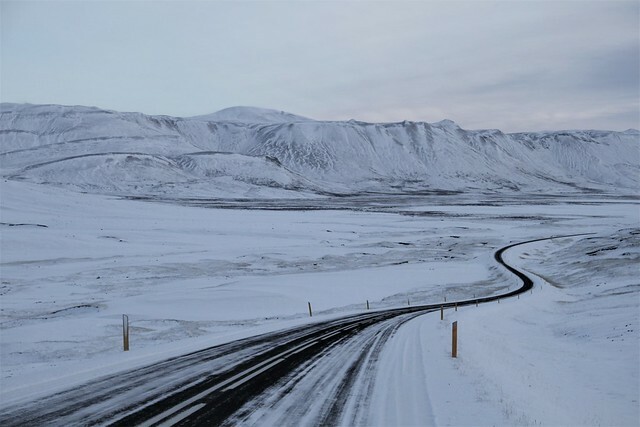 The guys looked like they knew what they were talking about – they were driving a monster 4×4 and had heavy duty winter gear on as if they were en-route to the North Pole. It’s hard to tell how serious the Icelandic people are being because they always have a grave face on. The older chap repeated that I mustn’t try to camp and his anxiety was contagious. They suggested I tried to reach the farm off the main road 25km away and I promised to head there. I wasn’t lying – the winds had started to blast and I was getting worried about the weather again. The peaceful morning had lured me into a false sense of calm but now I was reminded about the incoming storm. I quickly realised that there was no way I would reach the farm before dark. The winds grew stronger and stronger and I was barely able to reach 10km/h on my bicycle. If I was going to camp I needed to find somewhere very sheltered from the SE winds and close to an un-frozen stream to find water but now the heath had widened and it seemed unlikely I’d find shelter. Just then I spotted a barn in the distance. I rode over to it and discovered that it was abandoned. Just behind it was stream. It was a miracle! I let myself in and set up camp, safe from the incoming storm. I carefully hiked down to the frozen river, bashed a hole in the ice (stupidly using my saucepan for this, which is now so bent that the lid doesn’t fit) and returned to my new den. By the time I had put up my tent the saucepan had almost frozen solid. 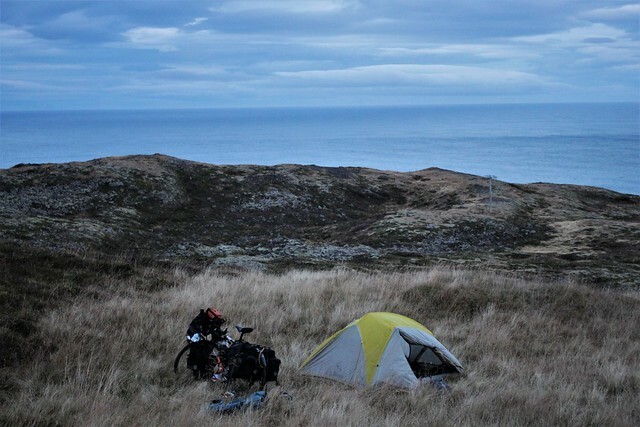 I boiled the water, enjoyed a couple of tea and ate dinner in my sleeping bag feeling very content with my lucky break. That cabin was the first man-made thing I’d seen all day and it was actually the only thing for 115km along that stretch of road. That night a storm raged like nothing I’d ever seen. 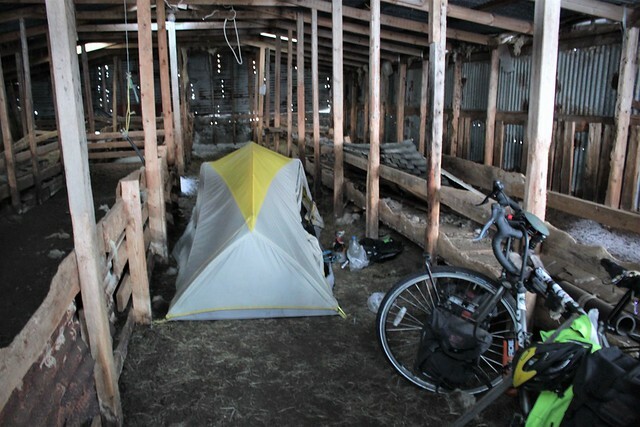 The whole barn rattled as the wind howled through the cracks.I felt like I was camping underneath a jet engine and the noise kept waking me up through the night. By the morning it was almost freezing – positively warm! I was in the barn for 17 hours (in at 4.30pm which is half an hour before dark and out at 9.30am which is half an hour after light). The nights are so long you have a good chance of riding out a storm! I had head winds all day but compared to the night time gusts it was quite peaceful. I made slow progress but I wasn’t in a hurry as the scenery was magical. 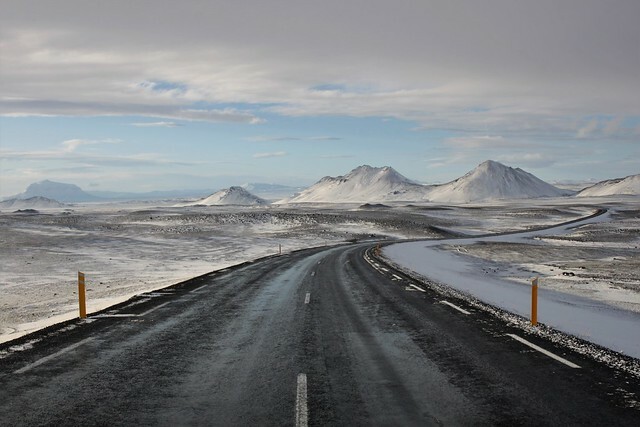 The landscape had been coated in even more snow and the white road faded into the horizon. 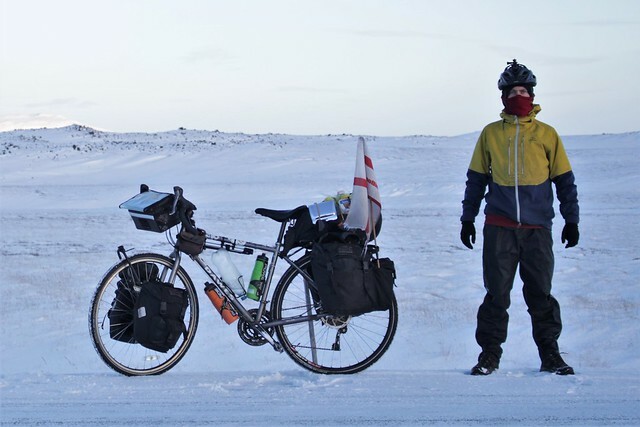 It was like cycling in Antarctica. That afternoon I reached the edge of the highlands section where the road dips back down into farmland. There was a small guesthouse there where I could camp. Iceland has this great thing called ‘sleeping bag accommodation’ where you just get a bed/mattress to sleep on. It’s cheap by Icelandic standards but extortionate compared to anywhere else in the world. 6,000kr (£44) to sleep with your own sleeping bag in a shared room. Crazy! I camped outside for £10. I think that’s only the second time I have ever paid to camp somewhere but once again it was worth every penny because they had heated kitchen I could hang out in until it was bed time. It was a difficult ride down the mountains. I don’t think the sun reaches here anymore and the roads were super icy. Flat cycling is OK on the ice but downhills are a little more perilous. I was grateful when it started snowing again (because then my tyres had something to grip) but soon it began to snow heavily and by the time I reached Fellabaer I was quite miserable from riding hours in the snow. I’d thought I had someone to stay with in Egilsstadir for my last night in Iceland but that had fallen through. Amazingly, Gunnlaugur, who I had met in Reykjavik did some networking and got me invited to the beautiful Lake Hotel to stay for free. They heard about what I was doing and wanted to treat me. What a luxury! I can’t remember when I’ve stayed anywhere so fancy, not since China. You even had to put the room key in the socket to turn the power on – you know that’s the real deal. My ferry was leaving the next evening at 8pm. 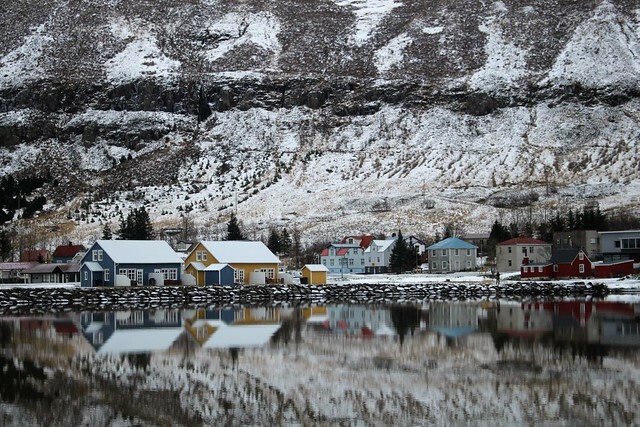 Perfect timing – Seydisfjordur is just 25km from Egilsstadir. But, as we now know, nothing is straight forward in this country and there is a big mountain pass between the two towns. A sign said the road was closed as I began the climb. 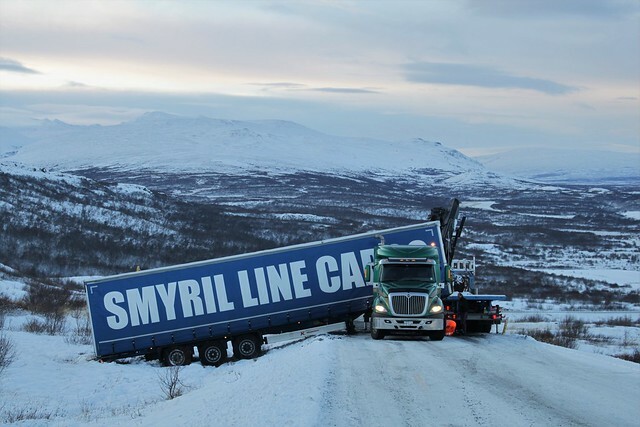 I could see why: up the mountain there was a lorry turned sideways. I continued up to the scene of the accident and saw a jackknifed truck blocking the road. I passed the waiting cars and the road emergency staff let me walk around the truck. The road was ridiculously slippery. Imagine an ice rink at a 10% angle. Now imagine trying to cycle up it. Not easy. I slipped over trying to get back on in front of the queuing cars which was rather embarrassing. It was even more embarrassing that I couldn’t even push the bike uphill without my feet giving way on the ice. I eventually reached the top and cycled a few gorgeous miles across the plateau on the mountain. 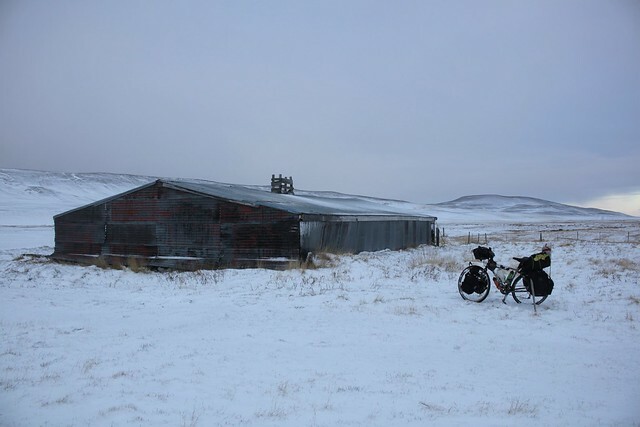 It looked like the highlands again – everything blanketed in snow. 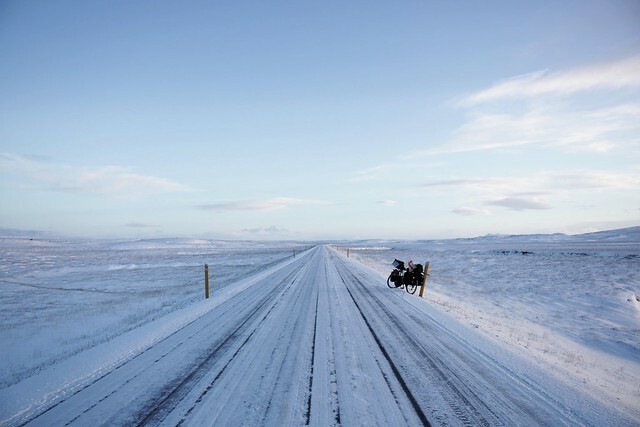 Iceland has been – hands down – some of the most beautiful riding of this entire journey. 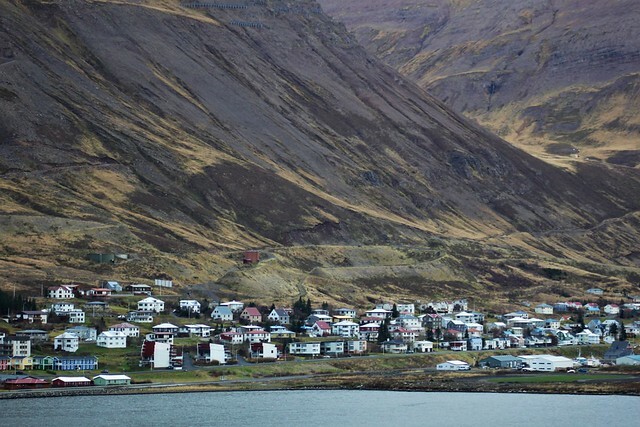 I dropped down to Seydisfjordur in the early afternoon. Big statement coming here: I think that might be the cutest settlement I have ever seen. 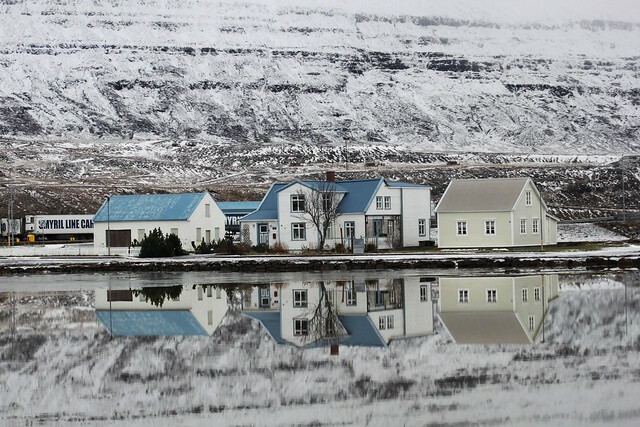 The still water reflected the houses like a mirror and the resulting spectacle was magic. The colourful houses had a different aesthetic here than in other places in Iceland. Many of the wooden ones were built by Norweigan settlers who came over in the golden years of herring fishing. Perhaps the finest moment of all my time in Iceland was getting on that boat and leaving the island. That may make it sound like I didn’t enjoy the country which is not the case at all. 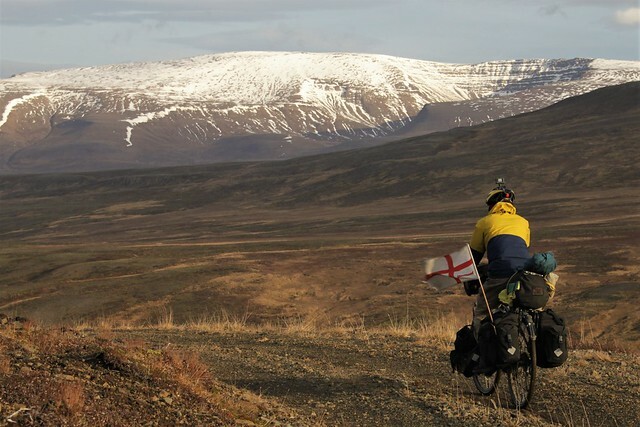 In fact, Iceland has undoubtedly been one of my favourite countries to cycle in the world and certainly one of the most beautiful. But it has also been one of the hardest. I think I’d go as far as to say that that last week was the toughest of my entire trip. When I said in the last blog that I wanted to ‘step outside of my comfort’ for one last time I meant just a little bit. Like, a couple of inches. Not so many miles out of it! I’m tempted to say that I bit of more than I could chew but clearly I made it in the end. It was just very chewy. In the end I swallowed it up. 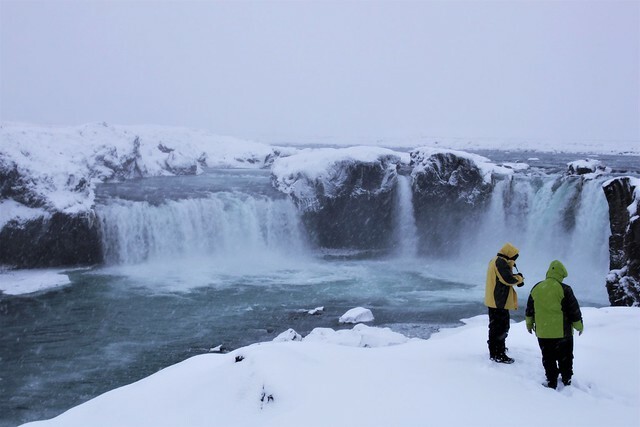 Iceland in November was one of those experiences that define this whole trip. Digging deep to summon the mental and physical strength to overcame great challenges are what makes us as individuals. It is those adventures that put hair on the chest and make you look back with great pride at what you have achieved. Those are the moments that make living so much fun. Thanks for having me Iceland. 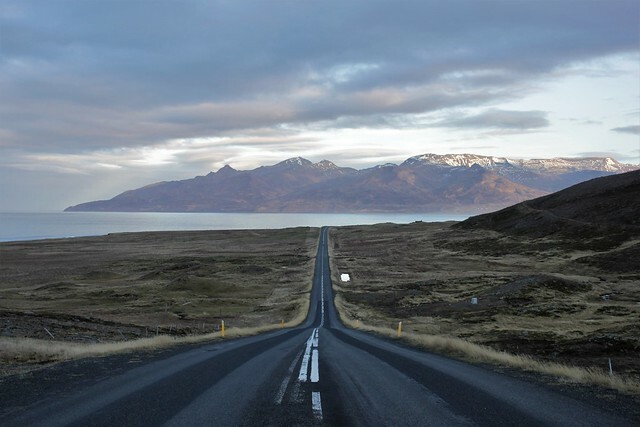 Next stop the Faroe Islands! You’re amazing & tough. What a bravery.Thank you so much for writing this blog.